Good morning out there Tampa and future Tampa residents! Big Boys Moving and Storage checking in again with another quick video moving tip of the day! 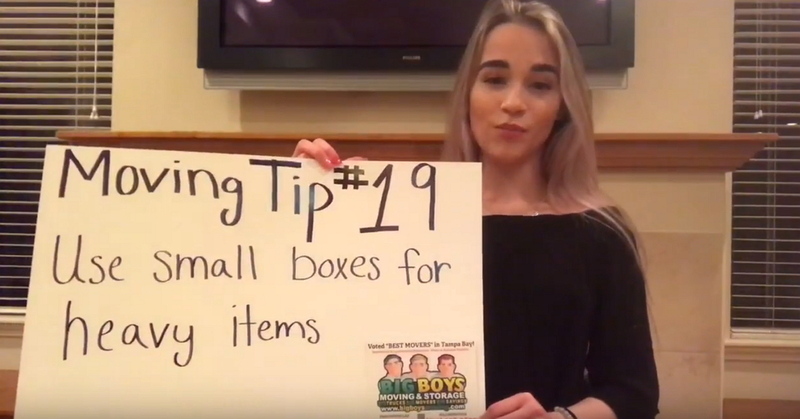 Today’s tip is number nineteen in our video moving tip of the day series of video segments. If you haven’t already, make sure that you check our YouTube channel or surf our blog to catch up on the whole video series! Why is it important to use smaller boxes when you’re packing heavy items? Well, when we move we all have a tendency to want to pack as few boxes as possible. Packing fewer boxes means fewer boxes to put together, fewer boxes to move, and fewer boxes to unpack. The problem with this, especially when you’re packing heavy items, is that the boxes quickly become too heavy. When boxes are too heavy they either fall apart and leave your stuff in a pile on the floor or they are simply too heavy to lift and carry safely. You can avoid this by using more smaller boxes to be sure that you don’t overload them. If you’re looking for a highly recommended and experienced moving company in the Tampa Bay area, Big Boys Moving and Storage can help. Voted the top moving company in the area for the past ten years running, Big Boys takes care of your move with no fuss and takes all of the care you would take yourself when moving your belongings. We are the most trusted moving company in Tampa Bay for a reason, let us show you why. Here at Big Boys Moving and Storage, we have a lot of great tips and tricks to help your move go more smoothly! We are out to save you money, save you time, and get your move done well and in a timely manner.